On Fairfield Road, Bow stands the Bryant & May match factory, which in 1980s became one of the first industrial buildings in London to be converted into apartments when it was renamed the Bow Quarter. In the summer of 1888 what happened in this building was to change the history of the labour movement. The match girls working there were regarded as the lowest strata of society; long hours in appalling conditions, hired and fired at the will of the management, and its workers suffering dreadful industrial injuries. Bryant & May were regarded at the time as a model employer, much the same as the Cadburys, a similar Quaker employer who built for their workers the Bourneville village. 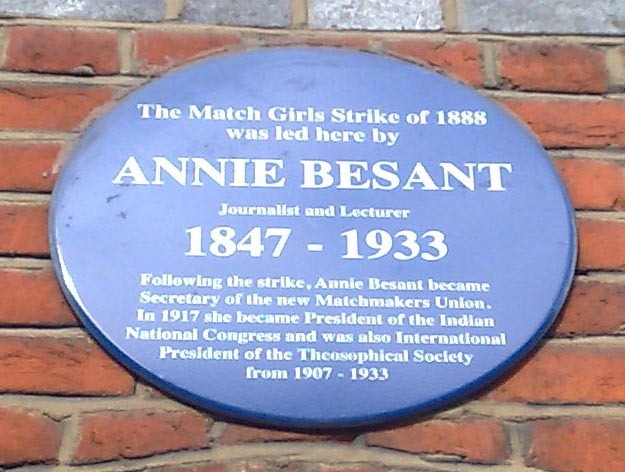 The Bryant & May strike started when a Fabian journalist Annie Besant after having interviewed some of the match girls wrote a scathing article of their life working in the factory. Entitled ‘White Slavery in London’ Besant highlighted that shareholders’ dividends of 20 per cent were achieved only by cutting their meagre wages lower than 15 years previously. The youngest of the women were so malnourished they still looked like children; the factory foreman would beat employees; and if they succumbed to an industrial injury they were sacked. Far worse than those conditions were phossy jaw where toxic particles from white phosphorous used in the match heads entered the workers jawbones through the holes in their teeth. Initially causing facial swelling eventually the jaw would decay with pieces of bone working through the suppurating abscesses. In the final stages, like lepers, they would live outside London as the smell from their decaying jaw became intolerable, before they succumbed to an agonising death. Besant’s article shocked the Nation and prompted the match girls to strike – the first of its kind in the country – it the sowed the seeds for the establishment of the modern Labour Party and women’s rights when employed. Questions were raised in the House by MPs. the Times published editorials shaming the previously unblemished reputation of Bryant & May, and socialite George Bernard Shaw among others voiced his support for them. The match girls even received death threats from someone claiming to be Jack the Ripper, whose reign of fear started some weeks later in East London. Within two weeks their demands had been met and they returned to work, but it would be a century later before Bryant & May would acknowledge any wrong doing on their part. Just a year after the match girl’s victory thousands of the country’s most exploited workers would gain union recognition, the most famous being after the Dock Strike which began at short walk from Bryant & May’s factory in East London. Next year marks the 125th anniversary of the strike which became a pivotal point in the trade union movement and employees working conditions. As Louise Raw remarked when interviewed on the Robert Elms show recently, now is the time to unveil a Blue Plaque alongside the one dedicated to Annie Besant, to those brave and exploited girls who had the temerity to take on a powerful employer – and win. A far more comprehensive history of the match girls strike can be found on Louise Raw’s website. I think they started a positive trend with the Bryant and May factory – my favourite conversion is the Trebor factory on Katherine Road in East Ham. Thank you for your comment. Next time I’m near Katherine Road I will check out the old Trebor factory conversion. I read that it is a classic Art Deco building. My understanding of the redevelopment is that it was the first major conversion of an industrial building. Alas there are numerous cases of psychiatric hospitals being turned into flats two, are very near to where I live.